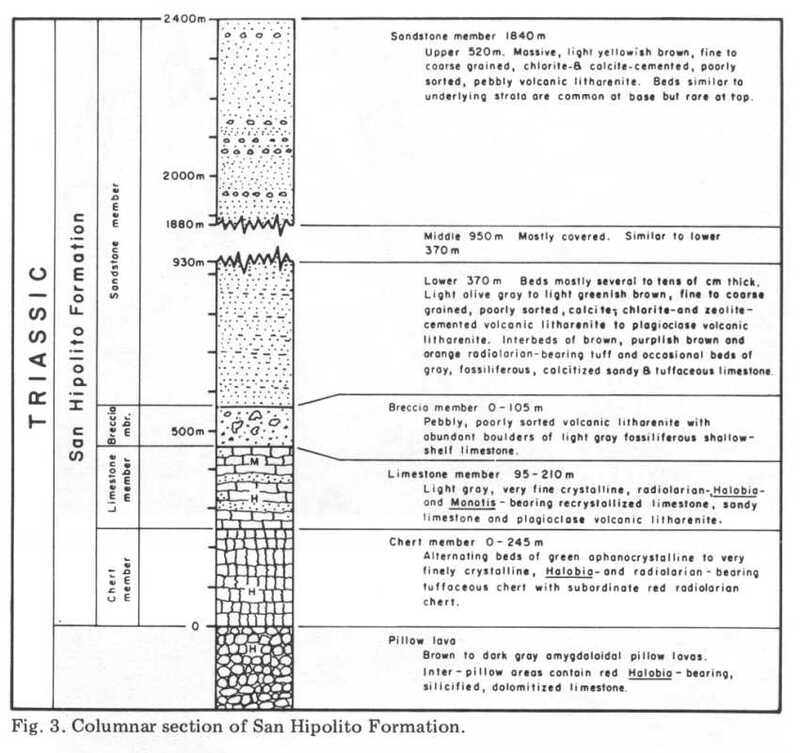 A stratigraphic section was measured along the coast between the pillow lava outcrop just northeast of San Hipolito and the southernmost point on Punta San Hipolito. A graphic representation of the measured section is shown in Figure 3. Outcrops along the coast are fresher and better exposed than those inland. The section measured along the coast is 2,150 meters thick. Maximum thickness of the composite section, measured in part on aerial photographs, is 2,390 meters. Most of the pillow lavas that are found inland are deeply weathered or covered by surficial deposits but several good exposures form small hills. Locally the lava appears to have intruded into the overlying chert. Inclusions of red and green chert were incorporated into the lava when it intruded. About 75 percent of the chert in the chert member (Figure 3) is composed of thinly laminated, green, sparsely fossiliferous, tuffaceous chert in beds several centimeters to tens of centimeters thick. Beds and lenses of red radiolarian chert make up almost 25 percent and less than 1 percent is black pyritiferous radiolarian chert. Light gray, recrystallized radiolarian chert is found adjacent to a sill. Green sandstone beds are up to 13 meters thick and make up the rest of the member. Flame structures and cross-bedding are common in the green chert and slumped and brecciated beds of chert are present toward the top of the member. The limestone member consists mostly of alternating beds of limestone and volcanic sandstone. Gray, cherty, tuffaceous, radiolarian, Halobia? and Monotis limestone beds of the limestone member (Figure 3) are only a few centimeters thick and are scarce toward the base, but they increase in thickness up to tens of centimeters thick and become dominant toward the top. Gray and brown volcanic sandstone beds are dominant in the lower parts of the limestone member and are up to tens of centimeters thick. The sandstone beds are a few centimeters thick and less common in the upper parts of the limestone member. Limestone boulder-bearing volcanic breccia lenses up to 6 meters thick form a minor part of the member. Locally, the limestone is chaotically folded and brecciated, indicating the rocks underwent slumping and sliding while still in a plastic state. The upper contact of the limestone member is an erosional surface with at least 100 meters of relief. Channel-shaped, graded, limestone boulder-bearing breccia lenses and graded, volcanic sandstone lenses of the breccia member (Figure 3) fill in the irregular upper surface of the limestone member. The coarsest breccias are found at the base of the member and some limestone boulders are as much as 3 meters in diameter. The lower part of the sandstone member (Figure 3) is dominated by beds of volcanic sandstone, siltstone, tuff and minor limestone. The beds are on the order of 5 centimeters to 20 centimeters thick. Placers of heavy minerals and low angle cross-beds are present indicating some of the sediments were reworked by currents. Soft sediment folding and slumping has taken place locally. The thickness of the middle part of the sandstone member (Figure 3) was estimated from aerial photos. Due to faulting it is not exposed along the coast and it is almost completely covered by surficial deposits inland. Based on observations of very poor outcrops, this part of the section appears to be similar to the lower part of the sandstone member. Massive sandstone beds up to tens of meters thick dominate the upper part of the sandstone member (Figure 3). Packages of beds similar to those found in the lower and middle parts of the sandstone member are common and thick toward the base but are less frequent and thin toward the top. Andesite granule to boulder conglomerate beds are common and some boulders are up to 2 meters in diameter.